Email or call us if you or someone you know is an individual, family, or non-profit group that would like to stay at Maine Forest Yurts! Our third annual Durham Warriors Survival Challenge was held from August 28th – 30th 2015 to raise money for disabled military veterans and their families and other non-profits to stay for free at Maine Forest Yurts. 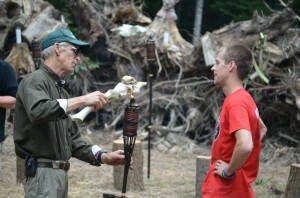 The event is a 4 day, Survivor-themed competition where contestants from around the country compete in various outdoor challenges, survive in the Maine woods, hold tribal councils, and vote for one winner. Photos of this year’s competition can be found in our gallery or at our Durham Warriors Facebook page. Our first annual Durham Warriors Survival Challenge was held September 5th – 8th 2013 to raise money for military veterans and their families to stay for free at Maine Forest Yurts. We had a blast and the event was a success! In total, 18 contestants from across the country, including four from Maine, took part in the competition. The three teams of six contestants each had a surprise visitor with the appearances of former “Survivor” contestants Terry Deitz, Eric Reichenbach and Kenward “Boo” Bernis.